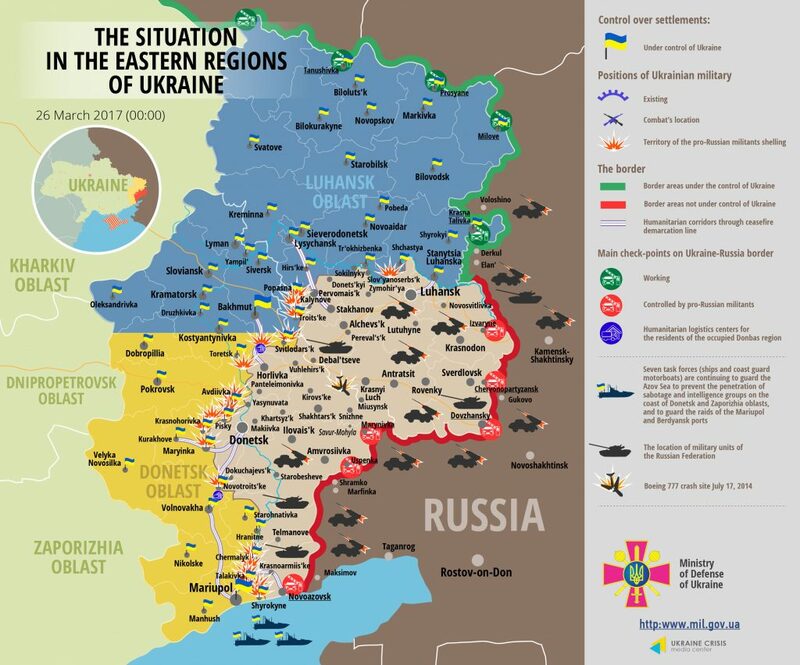 Ukrainian Armed Forces incurred no fatal casualties yesterday, but eight servicemen were wounded, informed Ministry of Defense of Ukraine spokesman on ATO related issues Colonel Oleksandr Motuzyanyk during a press briefing at Ukraine Crisis Media Center. Russia backed militant troops violated the ceasefire about 10 times near Svitlodarsk in the Donetsk sector yesterday using mortar launchers and armored weapons. The situation was similar near Horlivka where armed incidents took place in Zaitseve and Novhorodske. Moreover, two civilians, a man and a woman, were killed in Zaitseve in militants’ shelling. Militants were shooting seven hours with pauses in the Avdiivka industrial area. “Occupants launched about 70 shells. They were shooting from two directions, namely southern (Spartak) and south-eastern (Yakovlivka). ATO troops registered two attacks in the adjacent position near Kamianka, one of them from mortars. Near the Donetsk airport militants shelled our strongholds in Opytne, Pisky and Nevelske, using mortars deployed directly in the airport and Spartak,” elaborated the spokesman. In total, militants conducted 31 attacks in the Donetsk sector, and 15 of them involved heavy armor. Two main flashpoints in the Mariupol sector were Krasnohorivka – Maryinka and Pavlopil – Shyrokyne frontline areas. ATO troops registered two intense militants’ mortar attacks in Krasnohorivka, and shelling from tank and APC was observed in Maryinka. Vodiane and Shyrokyne were the main flashpoints in the south of the region. Russia-backed militants used mortars in Vodiane. Moreover, ATO troops registered several mortar attacks in Novotroitske. In total, 41 attacks took place in the Mariupol sector, 18 of them involved the use of heavy armor. “Militants used mortars in Popasna district in the Luhansk sector five times, launching 20 shells. One hostile attack happened in Lobacheve near Shchastia. Russia-backed militants violated the armistice nine times in the Luhansk sector yesterday,” informed Col. Motuzyanyk. Report on the military developments as of March 25 is available here. Interactive data on the shelling: chronology shelling chart and the interactive map.